Little Cypress Natives Nursery is located five miles north of Florence, Alabama, on the banks of beautiful Little Cypress Creek and on land once owned as part of the famous Forks of Cypress Plantation. We are open by appointment ONLY. Also, come visit our garden during April and May! 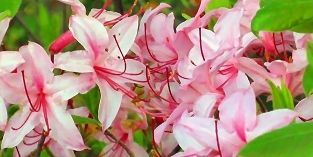 The specialty of our nursery is the native azalea. We carry many varieties in our inventory. We offer a full-range of landscaping services that can accomplish all the goals that you have in mind. We will be happy to come out and assess your property and give you a free estimate - keeping in mind your ideas and your budget.